The Original Puff Quilt Tutorial is no longer available. A brand new updated version is available for purchase in my shop! This tutorial is very comprehensive. It includes tips on picking fabrics, cutting fabric, and a page to calculate larger quilt dimensions. It is 50 steps and 57 pages total. You can make a puff quilt on a sewing machine even if you a brand-new to sewing! 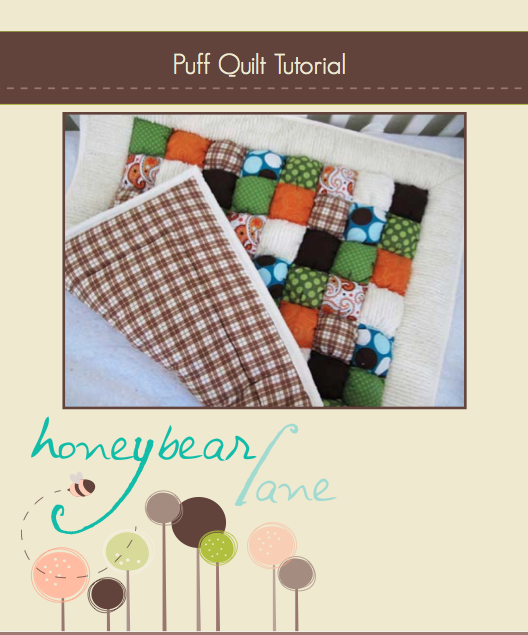 Follow this blog for updates, promotions, and giveaways for the Puff Quilt Tutorial!! It's beautiful. i wanted to ask do we have to put stuffing in the border around the puff blocks or can we leave it? Does that make sense? Your tutorial is wonderful! I think I might try to tackle this quilt for my first baby on the way! Do you use the walking foot for the entire process? beautiful! I'm inspired to try this! wow, this is awesome and makes me wish i had any sewing skills whatsoever! I am going to attempt this as a Christmas gift for my unborn nephew! wish me luck! after reading this tutorial, i think you should charge more for yours. that is a ton of work and they look gorgeous. what a horribly complicated process! 🙂 Thank goodness I can just go to your shop when I want one of these! Grazie per questi tutorial: precisi e molto chiari. Está maravilloso tu Tutorial. Gracias y Feliz Año Nuevo 2011, desde Venezuela con Mucho Cariño. What size buttons did you use when you did the white puffy quilt from Pinterest? What is the seam allowance for sewing the puffs? I purchased the puff quilt pattern several years ago, and I’m revisiting it for a baby shower gift. I cannot find the seam allowance listed anywhere in the PDF instructions. Thanks in advance!